Kids bicycles come in many different wheel sizes (12″, 16″, 18″, 20″, 24″) but the trouble is finding which bike size is right for your child. One of the greatest memories a child can have is when they first learn how to ride a bike. As parents we want our kids to have a great experience; learn quickly, be safe, have a bicycle that fits, and have fun, all at the same time! Here at Schwinn, we believe a well-fitted bike means that a child will be more comfortable, and being comfortable is the first step to inspire confidence and the motivation to learn. However, figuring out children’s bicycle sizing can be tough. Kids bike sizes are determined by wheel size. The wheel size of children’s bicycles directly correlates with the frame size of the bike; as the wheel size increases so does the frame size of the bicycle. 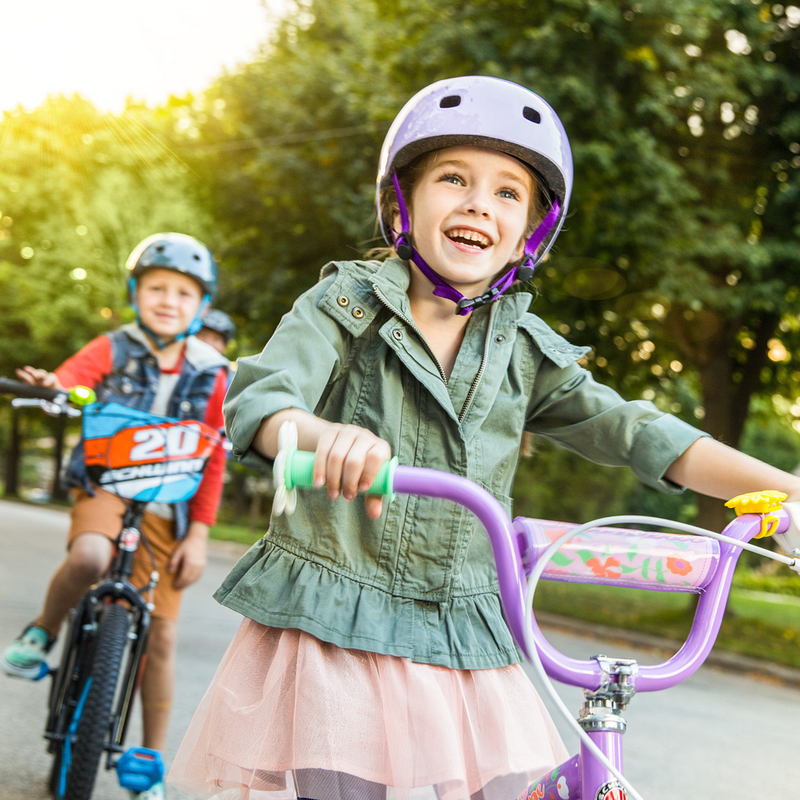 You can often make a good estimate for what size bike your child will need based upon their age, but with children going through growth spurts and variations in height, it is always best to measure your child’s actual height to find the perfect bike fit for them. Of course you should have them test ride the bike whenever possible as well!! This Schwinn kids bike size chart will help you determine the correct size bicycle that your child needs. Parents are often concerned that their child will grow out of a bicycle too quickly. Schwinn SmartStart is our solution to help your child’s bike “grow” with them. When the saddle of a Schwinn SmartStart bicycle is raised, the angle and the distance from the seat to the handlebars, and seat to the pedals also increase. This means your child’s bike will grow alongside your child. All Schwinn kids bikes from size 12” - 20” now come with SmartStart technology, as designated by the SmartStart logo on your child’s bike. You can see exactly what we mean and the other benefits of the Schwinn SmartStart bicycle line by watching the video below and checking out our technology page for more information.